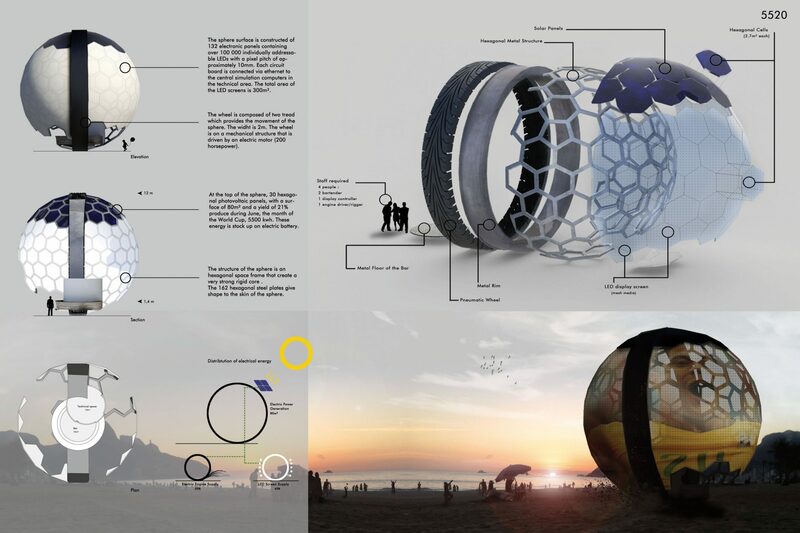 WINNING PROJECT – Innovative Minds 2013 – Orbs | gURROO - A new generation of innovative minds. Site : a large country living religiously for sport. Brasil will host the next fifa wolrd cup of football in june 2014. This competition will take place in 12 cities all around this very large country, from North to South. Cities known all around the world like Rio de Janeiro, Sao paulo or Brasilia will be part of the event. Football satuts in Brasil is more like a religion than anything. Every brasilian people lives through football. Brasilian football is famous for its history in the Wolrd cups and its stars such as Pelé, Garrincha, Romario, Ronaldo. Games will take place almost every day in different stadiums that will not be able to host everyone who would like to attend the games. Our goal through this proposition is to offer the cities of Brasil a device to display the games to every one. On the occasion of the next World Cup hosted by Brazil, the 12 host cities offer mobile and autonomous devices. These devices are inspired by the geometry of soccer ball, they are covered with hexagonal and pentagonal LED faces. These devices roam through the city before games, and brodcast some pre-match commentary, prognostic … They bring people together and guide them to popular public places like the place Arcos da lapas or Copacabana in Rio de Janeiro. There, fans can watch the game. The sphere has two hemispherical screens on each side, separated by the wheel that ensures the displacement of the ball. This allows each side to support his team. 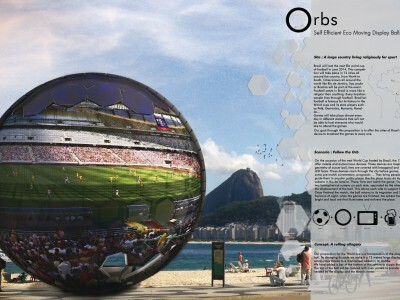 Once finished the match, the ball returns to its migration and leave for other horizons.At night, when the games are finished, the sphere transforms into a bright and loud orb that illuminates and enlivens the place. 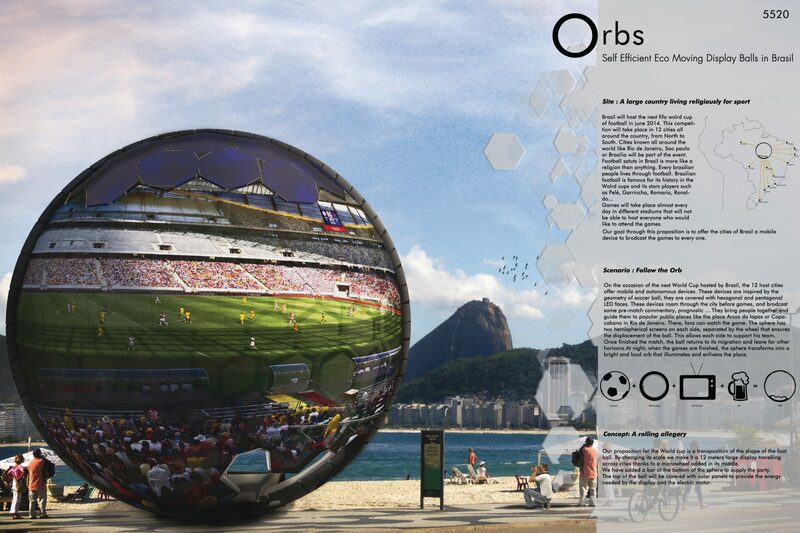 Our proposition for the World cup is a transposition of the shape of the foot ball. By changing its scale we make it a 12 meters large display traveling across cities thanks to a monowheel added in its middle. We have added a bar at the bottom of the sphere to supply the party. 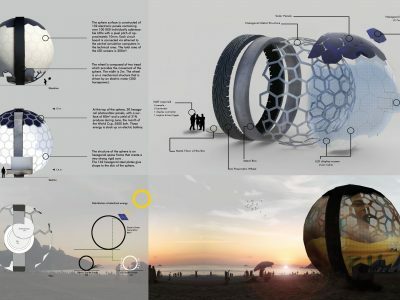 The top of the ball will be covered with solar panels to provide the energy needed by the display and the electric motor.